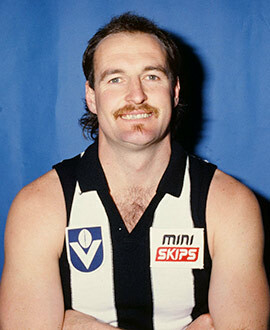 A dazzlingly brilliant winger with exceptional speed, Barham was recruited from South Warrnambool and established himself as a great Magpie favorite early in his VFL career. Barham had no problems finding the ball and his skills were of a of a high quality, but it was his pace that stood out. He kicked five goals in just his third career game against Hawthorn in 1977, and was a member of five Grand Final sides between 1977 and 1981, but never claimed the premiership he and his teammates so desired. A Victorian representative in 1978, Barham retired after the 1986 season to tour Australia. He later became Sydney’s recruiting manager and his son, Jaxson, played seven games for the club between 2009-2010.